Webfiles\status\status.php $status = new ServerStatus( "LOCALHOST", "LOCALHOST", "USERNAME", "PASSWORD", "DATABASE" ); Do not remove the credits, thank you. Ola, estou vendendo esse Thor Patch exclusivo Feito Totalmente pra meu servidor. Motivo da venda: Desiste do servidor de ragnarok. 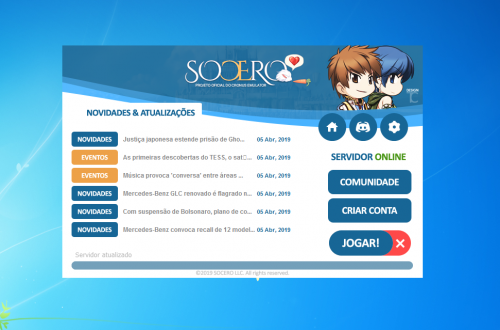 Sistema de Abas Facebook, Discord, Forum e Registre. Sistema de RSS NEW com Forum. Hi, I'm selling this exclusive Thor Completely Made Patch to my server. Reason for the sale: Give up the ragnarok server. Contains: Server Status System Online Player System Schedule System Facebook, Discord, Forum and Register Tabs. RSS NEW system with Forum. Att. Uhmm... 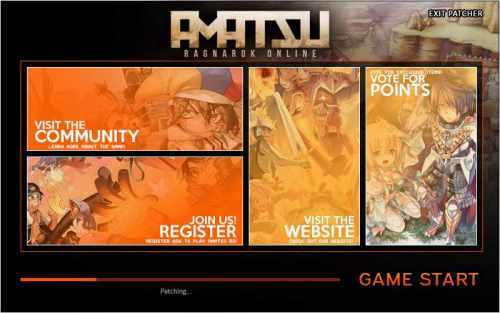 So the owner of Amatsu Ragnarok Online didn't pay me at all so here it is. Open the Config File (/ErgoPatcher/System/Config/PatcherConfig.XML) with Notepad++ or any other text Editor. <HTTPLink_Patcher_List> - The PatchList.XML file should be directly reachable. (On your website/server). It requires the complete patch to this file. "http:" is also required. <HTTPLink_Patches_Directory> - The remote folder where your patches will be downloadable. <RagnarokEXEName> Is required for the "Start" Button. Your client belongs into the /RO/ Folder. <MetroColor> The Patcher uses MahAppsMetro for thr window design. Possible colors without any further changes in this application are: “Red”, “Green”, “Blue”, “Purple”, “Orange”, “Lime”, “Emerald”, “Teal”, “Cyan”, “Cobalt”, “Indigo”, “Violet”, “Pink”, “Magenta”, “Crimson”, “Amber”, “Yellow”, “Brown”, “Olive”, “Steel”, “Mauve”, “Taupe”, “Sienna”. A tip: Keep the standard config around. So that you know where a number, a string or an bool (true/false) is requested. The rest is self explaining I guess. I have uploaded my version containing a rotating slider, as I've seen that being requested a lot of times. I've seen many people having issues with the RSU patchers ("Failed to retrieve x file"), so this software attempts to fix these problems. This application requires .Net 4.0. This is the major con, because players may not have this library installed by default (even though it's advised to install the .Net libraries for the renewal client). This application has been tested on Windows XP/Vista/7. This is not a replacement for the RSU patchers nor your own patcher (but I don't see why it wouldn't work?). Due to its implementation, if you do not provide a .inf file, the patcher will start at the beginning of the patching list. This means that if you're using patchRE.txt (you should), make sure you have provided all the patches from patchRE3.txt first in your installer, otherwise they will just get skipped (because the patcher only deals with one list). It's also strongly recommended to include the .inf file with your installer, whatever patcher you use. Leave a comment or suggestions ;o, thank you! I dont care if you remove my name in the credits. I dont care where you want to use it whether you sell it etc.. This is free to use and you can redistribute it. Please do not send me private message as my response would be in lowest priority. System Requirement: Windows 2000 or higher. No extra dll, not even config file is needed when distribute. ConfigGenerator - Packs configuration and resources into the patcher or generate as a binary config pack. Remote config, is on web server (of course), it used configure extended features. 5) Getting CRC of any file. 7) Build settings in the patcher using ConfigTool. Each configuration file has comments and explanations for most settings and options!